Because reptiles are cold-blooded they cannot regulate their body temperature on their own. This is why you will often see reptiles laying on rocks and in direct sunlight because that is how they warm their blood and body. 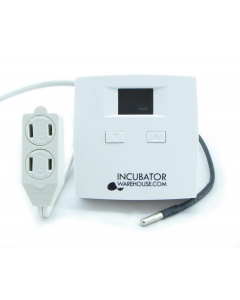 Since reptiles in captivity cannot move into the sunlight and shade whenever they want they need Reptile Heating Mats, Reptile Heating Pads or an Under Tank Heater in their captive environment to provide warmth. It is important to realize that reptile heating mats and reptile heating pads cannot be placed under the entire tank or the reptile doesn't have anywhere to get away from the heat being provided by the under tank heater. 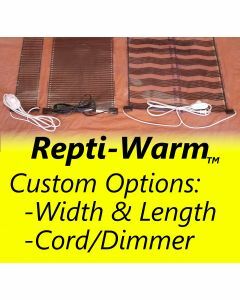 IncubatorWarehouse.com has their own line of reptile heating mats and reptile heating pads, the Repti-Warm Reptile Heating Mats are very rugged and ultra-thin. These under tank heaters can be ordered in practically any size, with 3 widths to choose from and a customizable length that can be used in almost any environment.